Authors: Roberto Maiolino et al. If you’ve read more than a few astrobites, you’ve probably heard us mention the idea of “feedback” in the context of galaxy evolution before. A quick search turns up at least a dozen separate paper summaries that mention it! Unfortunately, like so much of the jargon encountered on a day-to-day basis in astronomy, the usage of that term can be unclear, and it’s important to stop and think about what exactly feedback is and why we care about it in the first place. At the most basic level, a feedback loop occurs when the output of a process affects the future output of that selfsame process. If the effect is to increase deviation of the output from equilibrium, the feedback is positive; if the effect is to decrease the deviation of the output from equilibrium, the feedback is negative. The audio amplification that occurs when you have a microphone and speaker connected in a loop is an example of positive feedback. In astronomy, we also see positive feedback, such as when a massive star pushes out the gas around it and creates new dense regions for stars to form (there’s even a cool video of triggered star formation on YouTube!). In galaxy formation and evolution, however, we usually talk about instances of negative feedback. Why would that be important? The answer is in the galaxy luminosity function. The luminosity function is taken from observations (i.e., “empirically-derived”) and specifies the number density of galaxies as a function of their luminosity. This changes with the age of the Universe as galaxies form and evolve. 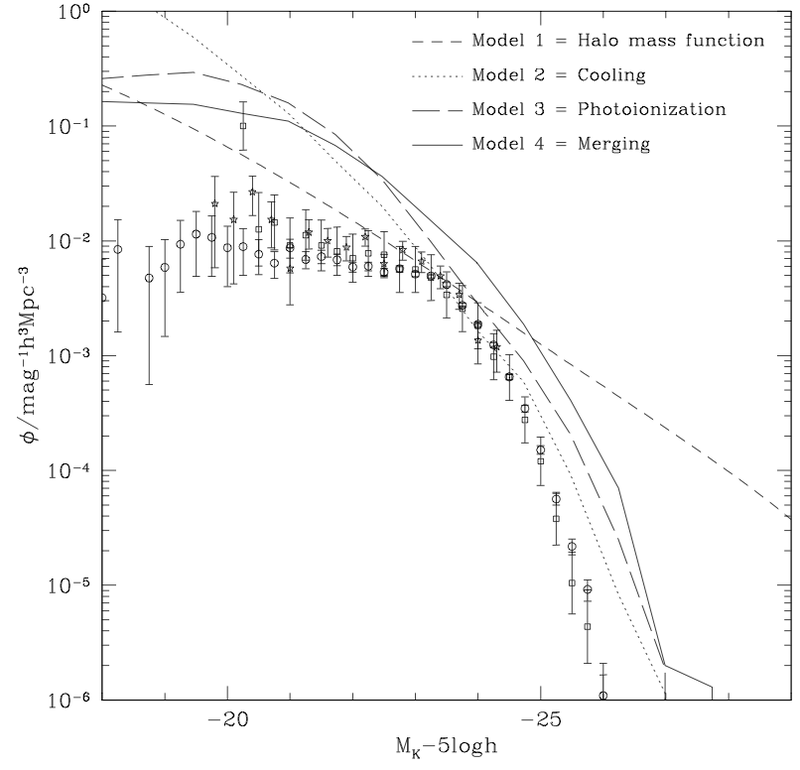 If galaxies were converting their entire reservoirs of gas into stars, we might naively expect the luminosity function to have the same shape as the distribution of dark matter halos predicted by the prevailing theory of cosmology, but this is not the case (Figure 1). Instead, there are fewer very faint and very bright galaxies relative to predictions. In order to get models that reproduce observations, theorists prevent efficient star formation at both ends of the luminosity function by either ejecting gas from galaxies or keeping it too hot to collapse and form stars. The energy to remove and/or heat the gas comes from either the stars themselves (via “starburst-driven” winds from stellar winds and supernova explosions) or from an active galactic nucleus (in the form of massive outflows or jets). Both of these processes are modulated by the current star formation rate and, in turn, determine the future star formation rate—this is precisely the definition of feedback! The contribution from active galactic nuclei (AGN) is more important for the bright end of the luminosity function, as the energy provided by a starburst is not sufficient to prevent additional star formation and drive out the remaining gas in these massive galaxies. Furthermore, because we already see such massive galaxies in place at z ~ 2 (more than 10 billion years ago) with virtually no gas or young stars, AGN feedback must have already been an important process at redshifts z > 6 (about 13 billion years ago), when the Universe was younger and those galaxies were forming. Still, although AGN-driven winds do exist at these high redshifts, there have not been observations of the sort of massive outflows that would affect an entire galaxy. 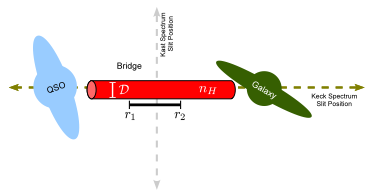 Figure 2: The radio spectrum of the carbon fine structure line in the host galaxy of the quasar (left), showing the broad component at the bottom which is associated with high-velocity outflowing material. The spatial extent of the broad carbon emission (right), extending to a radius of ~8 kpc (the FOV is ~140 x 140 kpc at the redshift of the quasar). Maiolino et al. think they’ve changed that with the discovery of a massive outflow in J1148+5251, a distant quasar at z = 6.4 originally observed by the Sloan Digital Sky Survey. Based on the velocity of the wind and an energetics argument, they conclude that the outflow must be driven by the quasar instead of stars or supernovae. Evidence of the outflow is detected in a broad, faint component of the [CII]158μm fine structure line (Figure 2, left), which extends to a velocity of 1300 km/s on either side of line center and could only be produced by ionized carbon moving at those speeds. Since supernova winds are not thought to exceed 600 km/s, this is a strong indication that the quasar must be responsible for accelerating material in the outflow. To be sure, however, the authors go on to estimate the mass outflow rate, which (from simple geometric arguments) is 3vM/R. Using 1300 km/s as the velocity of the outflow, a lower mass limit of 7 x 109 M☉ obtained by converting the luminosity in the broad [CII] component to an atomic mass, and a radius of 8 kpc estimated from the spatial extent of the broad [CII] emission (Figure 2, right), they find an outflow rate of at least 3500 M☉/yr. The minimum kinetic power required to drive this observed wind is Mv2/2 > 1.9 x 1045 erg/s, but the maximum power a starburst could provide, based the previously measured star formation rate of 3000 M☉/yr, is only 2 x 1045 erg/s. The authors contend that this means the starburst is unable to provide the real amount of kinetic power required to drive the wind, consistent with idea that the outflow is actually powered by the quasar. Are these values consistent with the picture proposed earlier? In order for the galaxy to appear as a “red and dead” elliptical at z ~ 2, the booming star formation seen at z = 6.4 cannot last very long, so that the stellar population still has time to age and become “red”, and any leftover gas must be ejected from the system, preventing future star formation (“dead”). Based on the measured outflow rate and the mass of the host galaxy’s molecular gas reservoir (~2 x 1010 M☉, inferred from CO observations), all of the gas should be cleared out within 6 million years, leaving plenty of time for J1148+5251 to evolve by intermediate redshift. The detection of such rapid truncation of star formation by a quasar-driven outflow at high redshift is solid evidence in support of AGN feedback as a critical component in the growth and evolution of galaxies. Hi, great blog. But I think there may exist a small mistake in the FOV. Yep, you’re right. I updated the figure caption to reflect the actual physical size of the FOV at the redshift of the quasar. Thanks for catching my mistake! Very nice post! Enjoyed learning about the AGNs and starbursts!